Matheson ran a blistering 6.09 qualifying pass in his first pass for the new 2012/2013 season. Matheson then went on to meet close rival Chris Porter on his Nitro Harley in the final, winning convincingly with a 6.2 versus a 6.8 at over 226 mph. 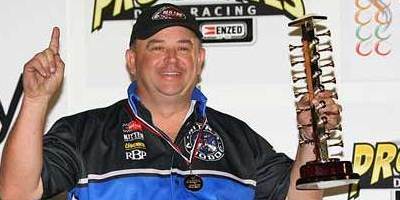 Matheson said “the track was the best he had seen it in the three years he had raced at Sydney Dragway. We had rain on the qualifying day, but, luckily got a good pass in straight out of the back of the truck. However, Sunday the track went away, with high temperatures ruining our chase to back up our 6.09 and reset our existing current track record of 6.111”. We still struggled with our early times, however, the bike got moving in the second half, with Matheson running the bike out past the finish line on each pass. Matheson said he was ecstatic with the result and said he was keen to get to Perth for Round 2, to try to improve on the 6.09 ET. Matheson went on to say, the bike was much better to ride, which is showing in our consistent speeds and ET’s. We will improve our times as we improve our short times, which will result in lower ET’s. Matheson will headline Top Fuel Motorcycle second round of the National series in Perth, Western Australia on 30 November at Perth Motorplex. Matheson has a strong track record in Perth and said it’s an important round in the Championship, as it usually sets the tone for the rest of the series, if you are fortunate to get a good result in Perth. Matheson said “the 4500 klm road trip is an enjoyable trek he has taken since starting some 4 years ago in the sport. Matheson said he enjoys the solitude of central Australia, no phone, only the rattle and whine of his 20 tone 1977 Kenworth Transporter, which he literally lives in while travelling across Australia’s infamous Nullabor Plains in central Australia. It’s a big deal crossing Australia, especially out there, with minimal phone coverage and the fact you need to rely on your wits to keep the transporter moving to get to civilization. Camels, Kangaroos, Dingos, Wombats, Rabbits, wild Horses, Goats, Pigs, you name it, it’s out there and none of them have any road sense. You can always tell how the season has been by the number of animals on the road. I love it and enjoy the journey. WebCam, Red Line Oils, RB Performance, Rocket Industries, CRC Industries, PDS Graphics, Kitten Car Care Products, GT Radiators & Machining, Hi-Side Leathers, PR Factory Store and special thanks to Larry “Spiderman” McBride & Steve McBride.